Since the war, the island of Corregidor (now partially hidden amongst the overgrown jungle) has been turned into a popular tourist attraction. Joe's friend Jupee Francisco (Eddie Infante), an army major who prefers to be called Pete, works there and agrees to take Frank back to the site of the battle that traumatized him. Once they arrive and Frank recounts his tale, Jupee tells him things couldn't have went down the way he recalls. He says the tunnel is closed off because its full of rock, steel and debris and all inside died instantly after the bomb hit. So how was Frank able to talk to them for hours while they were trapped? Was he out of his mind by that point, or was he speaking to their ghosts? Frank is skeptical of Jupee's story (a lie, as it turns out), especially after he decides to take a pretty native girl named Lita ("Ana Corita" / Helen Thompson) back to show her "the big guns." Believe the place is haunted by restless spirits, Frank goes back that night all by himself to face his demons once and for all. All but completely forgotten, this low key, mediocre ghost story (which isn't even listed as a horror film on IMDb, though it certainly qualifies) does one thing exceptionally well, and that's exploiting its setting. The giant, rusted batteries, pieces of schrapnel and weaponry peaking out through the overgrown jungle and crumbling shells of huge, abandoned buildings destroyed in the war acting as silent tombstones to the atrocities committed there make for a pretty haunting backdrop. 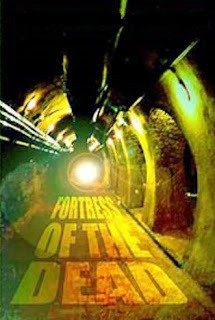 The film has no special effects; elements of the supernatural are conveyed simply through the sounds of footsteps, voices, creaking doors and digging from beneath the ground. The performances are passable, the writing is mediocre and the production values are low. It's also a visually flat piece, and there's really not really enough content here to sustain a feature length film. Still, it's worth a look just for the scenery. Director Grofé (who also wrote and produced) was the son of award-winning composer and song writer Ferde Grofé. He was a World War II historian who worked on many war documentaries and magazine articles. In addition, he wrote several westerns, including THE DAY OF THE WOLVES with John Wayne. To horror buffs, if Ferde Jr. is known for anything, it's probably for directing the atmospheric but middling Satanism tale JUDGEMENT DAY, which received a decent VHS release (in an eye-catching video box) by Magnum in 1989. Fortress on the other hand is seldom-seen, seldom-discussed and didn't receive much of a release despite being in the public domain. It's available on DVD-R from Sinister Cinema, but their print is soft and has both print and audio damage (plus several bad jumps - possibly to remove damaged frames). Since Sinister's packaging is atrocious to put it mildly, the ad art shown above is from the RetroFlix DVD. Some sources claim this was made for television, but I have my doubts about that. A scene with the lone female cast member coming out of the water in a revealing wet t-shirt never would have been filmed for a television production.